then a MSDS for the resin MUST accompany the screw. In most cases, screws can be rebuilt at a considerable cost savings over replacement. Flites rebuilt with Stellite or Colmonoy Hardfacing normally last longer than a new general purpose screw. 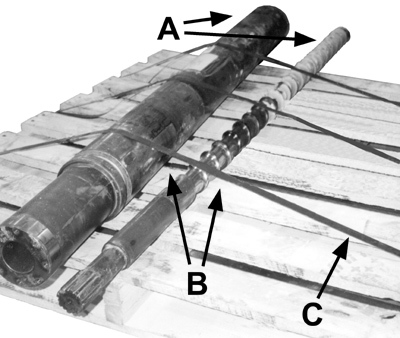 We can rework root diameters, change compression ratios, replace broken drive ends and tip ends, repair I.D. threads, etc. Rebuilt screws can also be hard Chrome plated or Nitrided. Most standard rebuilding can be estimated over the telephone. Standard rebuilding consists of inspection, grinding down the flite O.D., building up with Stellite #12, grinding the root diameter to clean-up, adding the surface treatment, finish grinding, straightening, and polishing. Phone estimates are not firm until inspection has been completed. There is "NO CHARGE" for inspection. You will be contacted with a firm price and no work is ever performed without your approval. Plastic Services & Equipment will hold parts sent in for inspection for a maximum period of six (6) months, after which the parts will be scrapped at our warehouse (unless prior arrangements have been made). All incoming parts for rebuilding, repairs, etc. must be shipped to PS&E "Freight Prepaid" in a strong, reusable container (see examples below). The Bill-of-Lading should be marked: MACHINERY PARTS, STEEL, CLASS 85, FREIGHT PREPAID. Smaller items weighing 70 pounds or less should be shipped via UPS Prepaid. In the event that items are received "Freight Collect", our Receiving Department must obtain approval prior to accepting the shipment. If the shipment is accepted, you will be billed for the freight plus a $35.00 Processing Fee. PS&E reserves the right to refuse the shipment. Terms for Freight Charges: Net 10 Days. A copy of the original freight bill will be sent with the invoice. If parts are received in a non-reusable container, PS&E will build a crate to return the repaired parts, and the customer will be billed for the cost of the crate.